What a week this has been! As we wrapped up our accreditation visit today, it was great to hear the tremendously positive feedback from our visiting committee members about our staff’s commitment to each students’ learning and growth, the school’s strong use of data to make instructional decisions, the close and supportive school-parish relationship, the fabulously supportive parent community with which we are blessed, and to hear their affirmation of the impressive work our teachers do in creating engaging and effective curriculum units that integrate the Common Core State Standards with Catholic Identity and our School-Wide Learning Expectations. Visiting team members asked for samples of the templates and plans our teachers have developed to take back to their schools and were impressed with the leadership that our teachers provide in many ways within the Archdiocese. They shared that the OLG community (staff, school/parish leadership, parish community, school students and families) clearly share a cohesive sense of mission and vision for making OLG the best it can be! As always, our students are the best ambassadors of what an OLG education means. As the chairperson shared with us, “It has been the Committee’s pleasure to witness Our Lady of Guadalupe School students who are keenly aware of their relationship and responsibility to one another, with a desire to seek wisdom and truth through social justice, and grounded in the discipline to become leaders and lifelong learners.” They talked about our students’ commitment to making OLG a community of respect and about the articulate and confident way in which OLG students at all grades shared about their learning process. Our 8th grade and kindergarten classes, and the 4th/5th chorus led us in a wonderful liturgy with the theme of servant leadership. The committee me mbers were truly impressed as they interacted with our students! The school staff is so grateful for the many ways in which you helped to make this week a success: sending us good wishes and praying for our visit; providing food and hospitality in the committee’s Walmesley Center work space; talking with visiting committee members about your family’s experience at OLG; participating in surveys; and attending or serving as a Eucharistic Minister at our all-school Mass. All of you who work on the playground, help in classrooms, and more, on a regular basis were noticed and appreciated by the committee. Very special thanks to Erin Stampe who did the most amazing job of organizing volunteers to prepare food, serve it, set up and clean up. Thank you, Erin, and all of our generous volunteers! We won’t get our “official” accreditation determination until mid-June, but it was affirming to hear the positive feedback and initial report today. We’ll catch our breath before launching into the Action Plan for ongoing improvement that we created as part of the process, and just a reminder that we will celebrate with FREE DRESS tomorrow! Please consider joining us for the Stations of the Cross, led by 7th grade, on March 31st at 2:00 pm in the church. Also, we hope to see you at the Holy Thursday Soup Supper in the School Hall at 5:30 pm, cooked and served by the OLG School staff! First graders packed their suitcases with their essential belongings and set out on an adventure to AUSTRALIA! 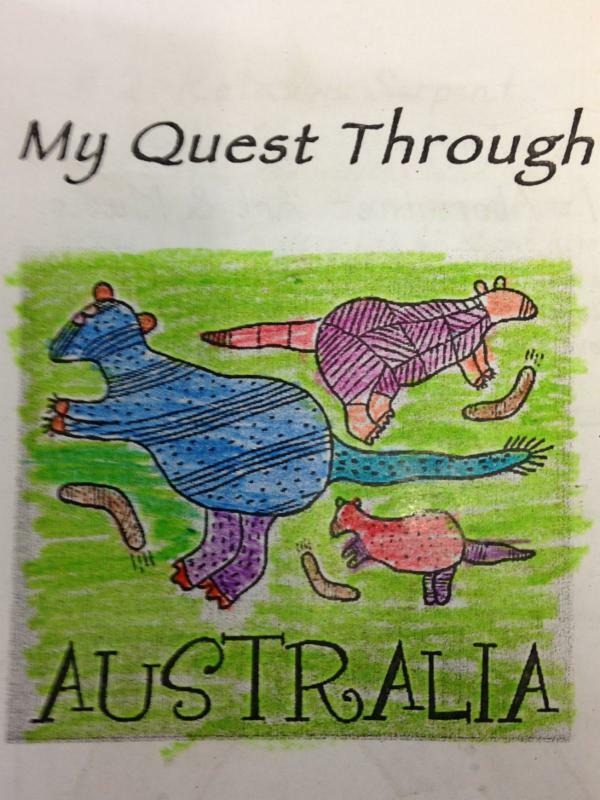 The iPads enabled students to go on a virtual learning quest through Australia; they recorded their learning in a quest booklet to remember the adventure. On the journey they saw amazing geography with beautiful beaches and the expansive outback. The dove into the ocean and saw the creatures of the Great Barrier Reef. They discovered amazing animals unique to Australia like the kangaroo, the duck-billed platypus, and the emu. The learned catch phrases like “G’day, mate!” and “Ring you later!” They saw amazing architecture like the Sydney Opera House. They explored native art and music of the Aborigine people and created some of their own Aborigine-inspired artwork with boomerangs, didgeridoos, and animal paintings. We noted how Australia’s history mirrors the United States’ own history in many ways. Over the next week we will wrap up our unit of study and bid farewell to the Land Down Under. This week fourth grade had a visitor from 1843. He delivered much wanted mail but would not allow our fourth grade emigrants entry into Fort Laramie. The fear of cholera is just too great. Fourth grade participates in the StroryPath Oregon Trail Unit. This teaching strategy engages students with problem solving and story telling. StoryPath units integrate content and skills from many disciplines. While we are learning about history we are also reading primary historical documents, charts and maps. We are writing, reflecting and negotiating. We are creating art and composing a story. Fourth graders are asked to think critically about what they know, use prior knowledge to make sense of new information and connect personally to important social studies concepts. As we negotiate decisions we write to compare and persuade. Our setting is 1840-1863, various stops along the Oregon Trail. Fourth graders create characters, form “family units” for the journey. 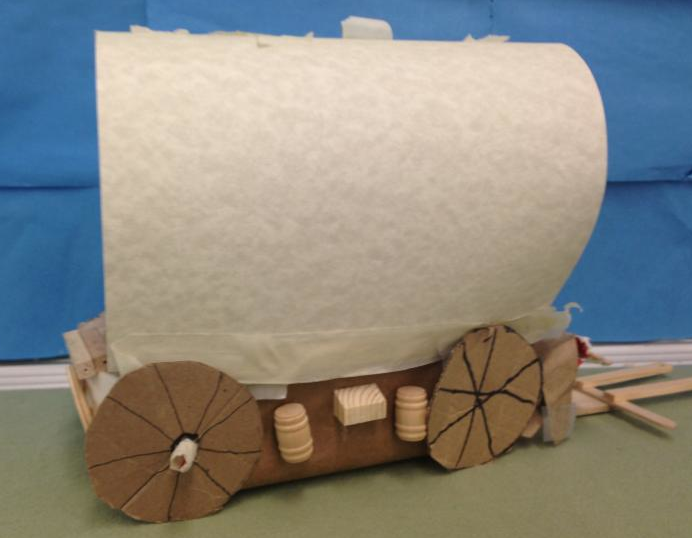 We construct wagons, make supply lists and choose a wagon train captain. Our plot unfolds with different episodes. Our poor emigrants have already experienced the loss of a wagon due to a thunderstorm and flash flood on the Plains. They’ve just survived a cholera outbreak but have not been allowed to stop at Fort Laramie. Will we make it over the Rocky Mountains before the first snowfall? Perseverance and critical thinking needed! Come enjoy a fun family Bingo evening on Saturday, April 25th, from 6:30 – 9:00 in the School Hall! We are coming up on our last big fundraiser of the school year… the 28th annual OLG Jog-a-Thon! Our goal: to raise $30,000! The theme this year is called “Top It”! We have a challenge for each student: to dig deep, find inner strength and TOP the number of laps ran last year. They are all a year older, taller, faster, stronger and smarter! So, it’s time to dig deep and find what it takes to TOP IT. Fitness is not about being better than someone else; it’s about being better than you used to be. Look for more information coming home in the FCE next week regarding the challenge, pledges, prizes and volunteer opportunities. Kindergarteners will continue to use Kidspiration for the remainder of the year focusing on correct beginning and ending punctuation. Another focus will be to capitalize one’s own name. A classroom alphabet book is in the works. 1st Graders have recently completed a book using a pattern 1 and pattern 2 sentences. Each student was required to write a pattern one sentence, such as: The boy can run. This sentence was then expanded to make a pattern 2 sentence: The very busy boy can run to the playground. Each page was illustrated. 1st graders are now working on a salmon book! 2nd Graders have been busy typing Haiku Poems, Story Mapping, Identifying Solids and Liquids, and Identifying the Rainforest Strata. 3rd Grade is currently working on an Africa animal research project. Students will write an essay with their findings and include a graphic. Most students have turned in their Glossary page, which includes key terms, parts of speech with a definition, and a graphic. Another exciting project 3rd grade recently completed was a Terracotta Warriors research assignment. 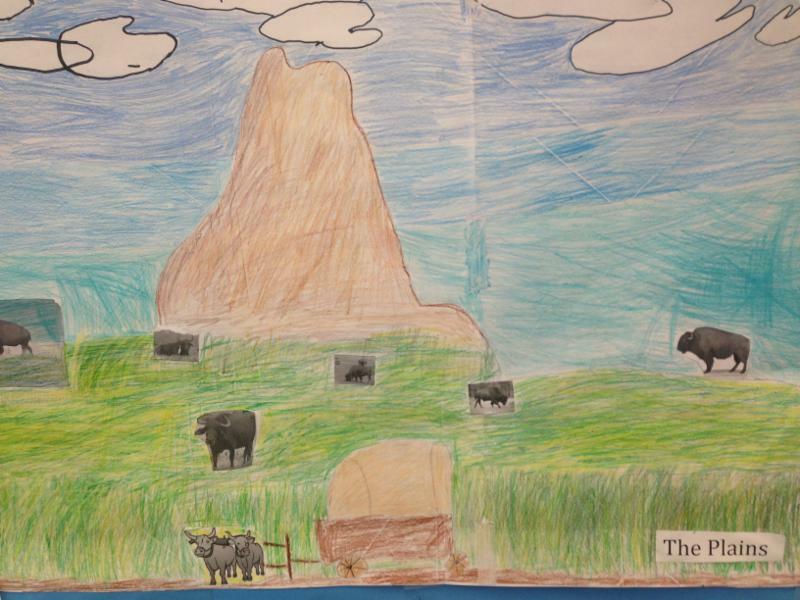 4th Grade just recently completed a research project that involved using the Seattle Public Library database to find information on the dangers of the Oregon Trail. Students were required to read an article using a “chunking” strategy that Mrs. Wilson uses in her classroom to help students break down difficult text into manageable pieces. Students also completed a Westward Movement timeline, and were introduced to PowerPoint, which students are ready to use for a presentation. 5th Graders have worked diligently on their Evolution of Technology projects. Students were required to choose a form of technology and research their topic, write a five-paragraph essay and give a PowerPoint presentation. Student presentation ranged from the telephone to rollerblading. Excellent work, 5th grade! We follow Jesus this week on our Lenten journey as he enters into Jerusalem, a community he knew well. CRS Rice Bowl asks us, too, to prayerfully enter into our own communities, to find those who are hungry and thirsty, who need our help. How does our Lenten journey motivate us to serve those we encounter in our daily lives? As part of your response, please remember to bring your Rice Bowls to Holy Thursday Mass on April 2nd at 7pm. We will collect the bowls and say a special prayer over your offerings. You can also write a check made out to the parish with “CRS Rice Bowl” in the memo line. If you’ll be away during Holy Week, you can make your donation online. All-school FREE DRESS to celebrate all of the work that went into making our accreditation week a success! In thanksgiving for a positive and affirming WCEA Accreditation Visit and for all of the work of our community to make it a success! Please pray for comfort and peace for Bart Stephens, nephew of Ms. Clare.